Is your yard part of the problem, or the solution to climate change? Many yards are a problem: gas-powered tools, fertilizers, pesticides, and sending yard waste to the landfill are major contributors of greenhouse gasses. Instead, our organic landscapes can host beautiful flowers to feed pollinators. They can shade our homes in the summer, manage stormwater, grow delicious and nutritious food, while removing carbon from the air and sinking it into the soil. Want to take it a step further? Incorporate backyard chickens, bees, or small livestock. 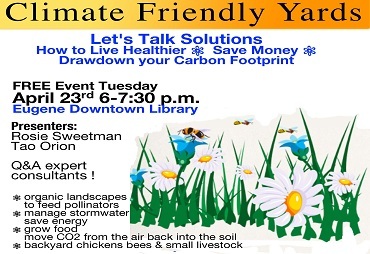 Learn from local landscape and farming experts about the steps you can take to improve your climate-friendly yard. This event is free. Spanish interpretation available. ¡Contaremos con traducción al español! Rosie Sweetman owns and operates Little Wings Farm, a Certified Organic vegetable, berry and cut flower farm in Eugene. For the past 10 years she’s farmed both large-scale commercial farms, as well as small educational farms in the Willamette Valley. She’s also taught at LCC and UofO about growing food and agriculture. She also leads community workshops on transitioning lawn to garden and composting. Tao Orion is the author of Beyond the War on Invasive Species: A Permaculture Approach to Ecosystem Restoration (Chelsea Green Publishing, 2015). She teaches permaculture design at Oregon State University and at Aprovecho, a 40-acre nonprofit sustainable-living educational organization. Tao consults on holistic farm, forest, and restoration planning through Resilience Permaculture Design, LLC. She holds a degree in agroecology and sustainable agriculture from UC Santa Cruz. She also grows organic fruits, vegetables, seeds, nuts, and animals on her southern Willamette Valley homestead, Viriditas Farm.